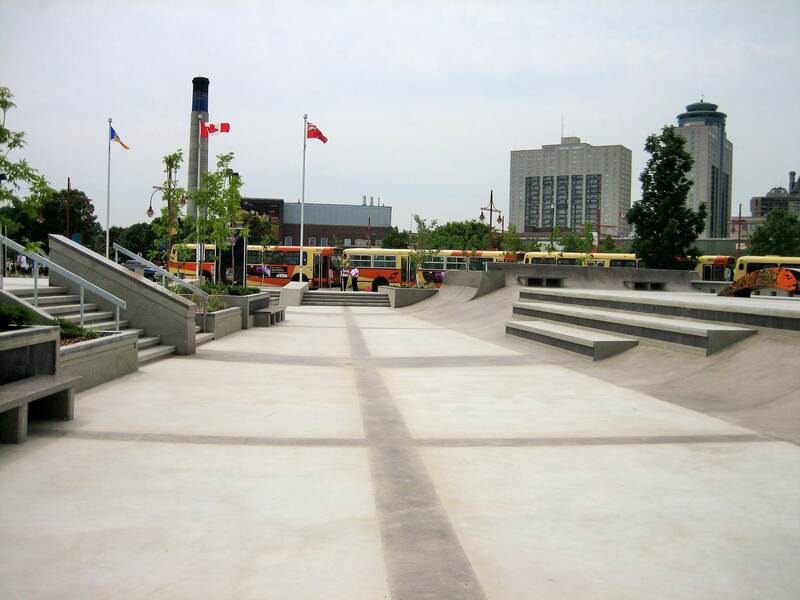 Covering a total area of nearly 48,000 square feet, the Plaza at the Forks consists of a meticulously detailed skateable sculpture plaza and expansive modern bowl complex tied seamlessly into the heart of downtown Winnipeg’s urban fabric. 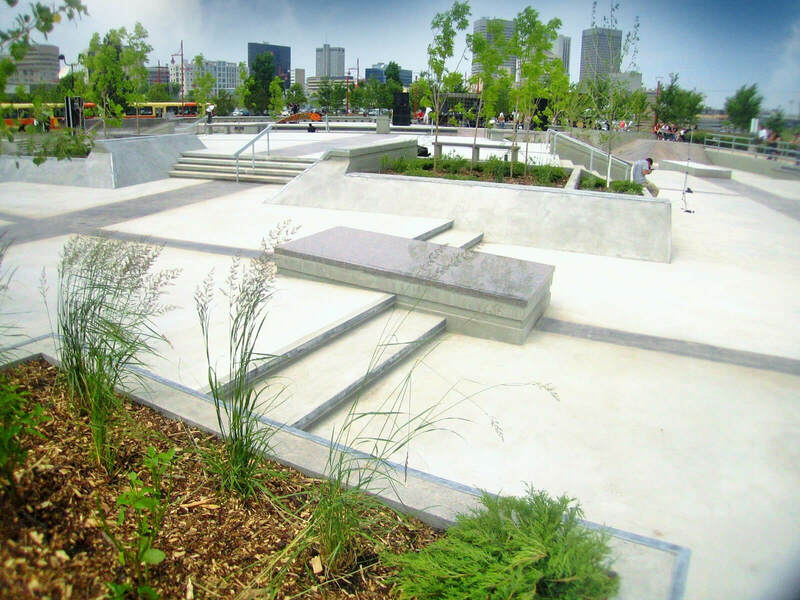 The facility is the first of its kind within the world and has quickly become one of Winnipeg’s most celebrated public places and a destination for skateboarders and other urban explorers from around the globe. The concept for the Plaza was unique from the onset. The Forks, aptly named due its position marking the amalgamation of Assiniboine and Red rivers, serves as one of Winnipeg’s premier meeting places. The area is steeped in over 6,000 years of cultural and historical significance and is visited by over 4 million each year for a range of attractions and activities. Accordingly, the riverside setting is highly programmed with stringent development guidelines and a commitment to the utmost site sensitivity. 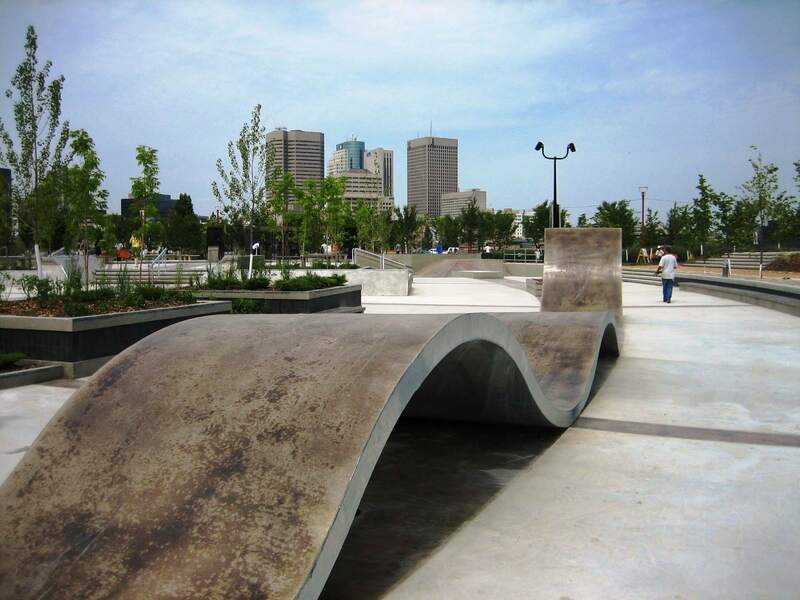 Our team took on the challenge of preserving the essence of this beloved public space while introducing a thoroughly modern world class skateable environment. 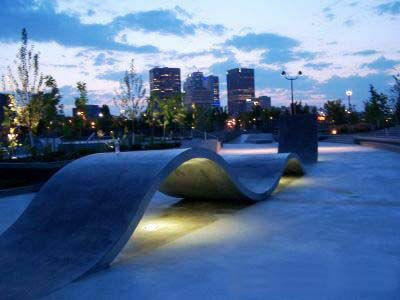 The result is an urban landscape like no other. 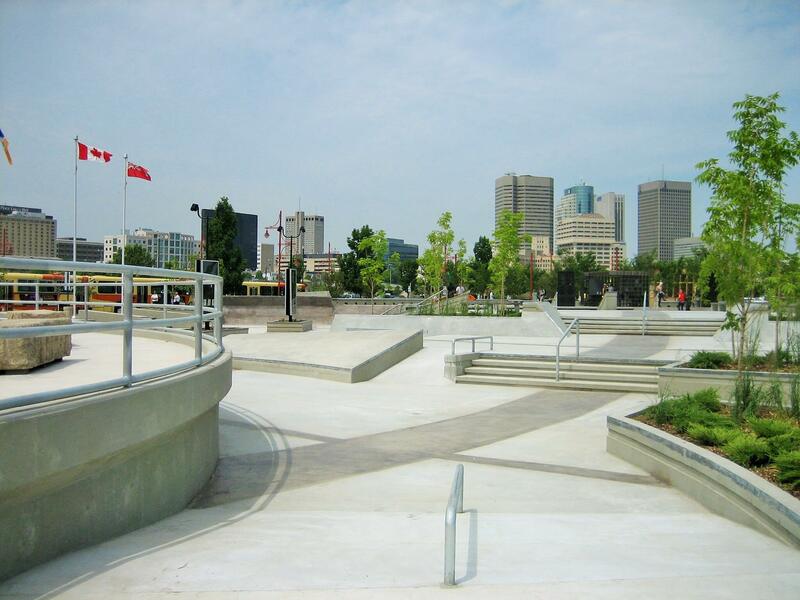 Far from the typical skatepark, the Plaza at the Forks is better described as a premier urban park/plaza and gathering place that is ‘perfect for skateboarding’. 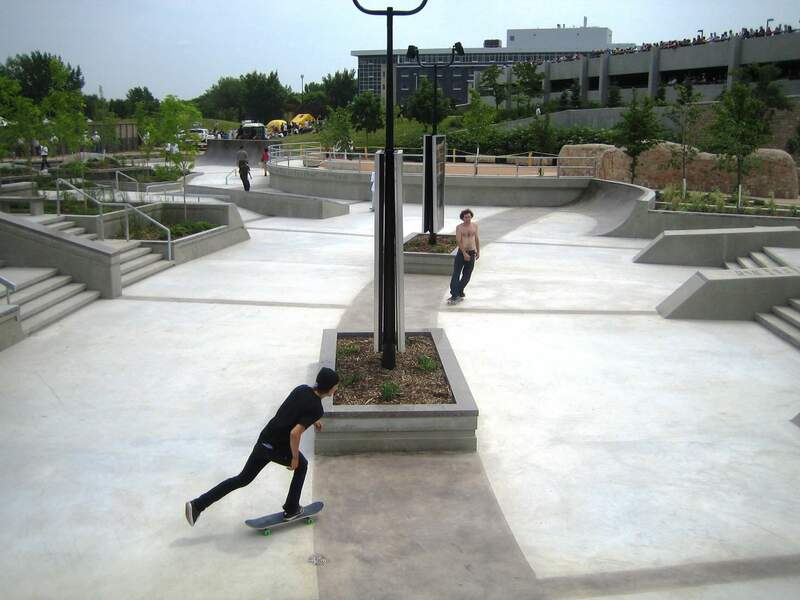 On any given day, one will see up to hundreds of visitors skateboarding, inline skating, biking, viewing art, strolling through, or simply sitting by to watch and socialize. It has truly become a place for all ages, back grounds, and interests to enjoy. 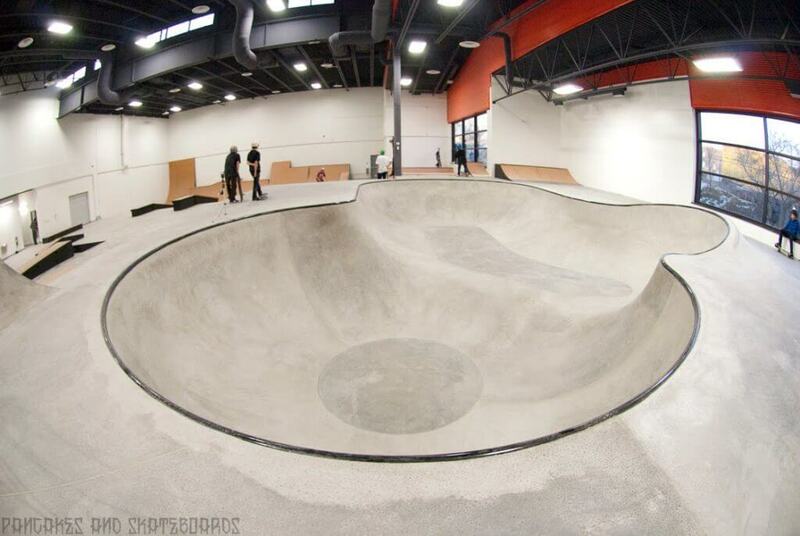 Bowl Complex: Separate but adjacent to the Central Plaza lies an 8,500 square foot bowl unit combining traditional pool and modern coping lines. Walls begin at 5 feet and progress through a series of hips, elevators, extensions, and a pump bump to a massive 17 foot cradle and 13 foot over-vert pocket. 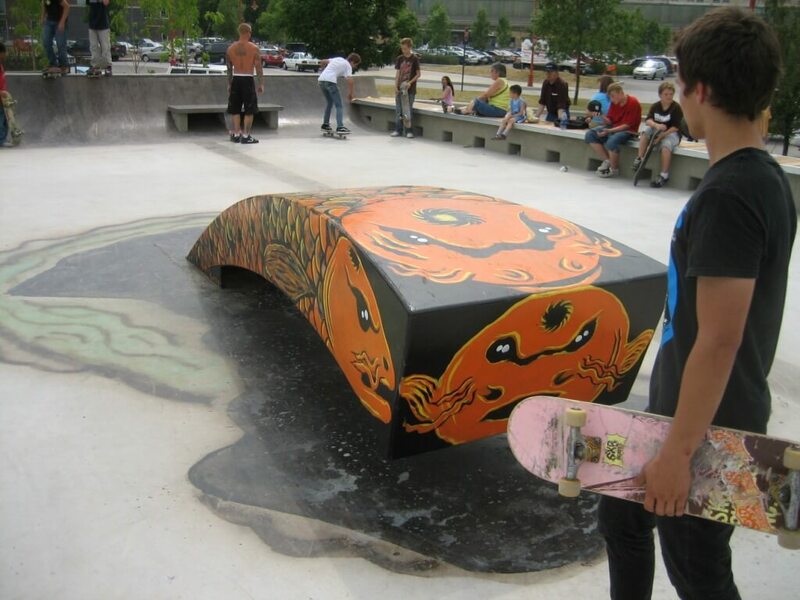 Ridden by beginners through to the likes of Tony Hawk and Alex Chalmers, the bowl can often become the center of activity with hundreds of spectators in the surrounding informal viewing areas. 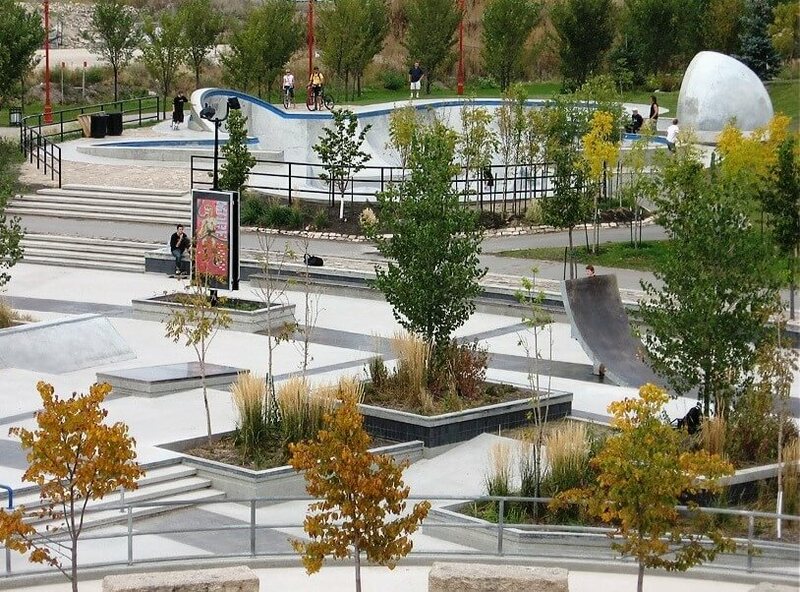 Our team finished the park off with unique lighting, a network of ‘safe’ pedestrian walkways and viewing areas, and consultation on the creation of an ‘Ambassadors’ program designed to educate visitors on skateboarding etiquette and ensure an enjoyable experience by all. The entire project is built on state of the art construction and engineering designed to withstand the difficult ground conditions dramatic temperature fluctuations characteristic of the region. Proven cold weather skatepark construction techniques developed by New Line Skateparks were matched with innovative void forming and reinforcement technology implemented by PCL and local engineers. Over 200 precast piles, highly specialzed concrete mix designs, and an expansive grade beam system will ensure maximum surface integrity over many decades to come. The plaza is another first, not only in North America, but around the world. 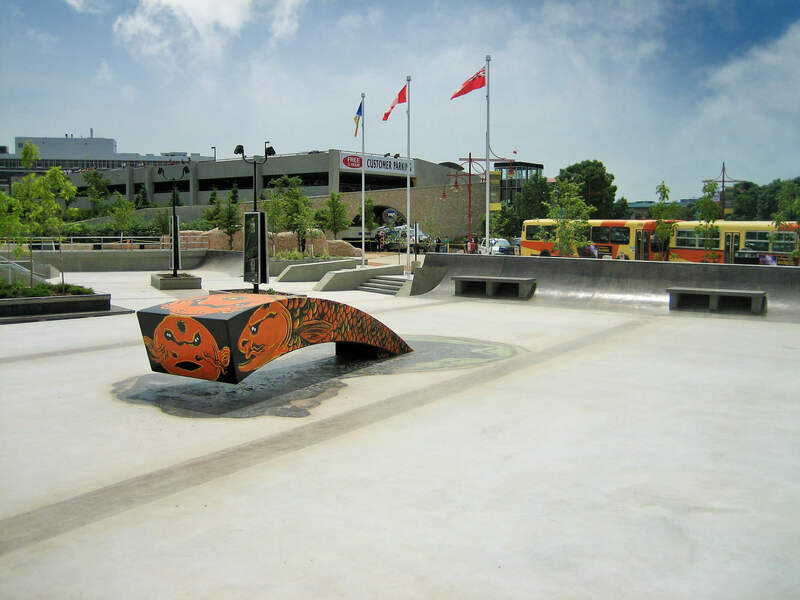 To date, the level of aesthetic detailing, site integration, incorporation of sculpture and art, and positioning within the urban context is unmatched by existing skate facilities. The Plaza is open to everyone across all generations and will soon tie directly into the entrance of the Canadian Human Rights museum.